Who can run for a position on the DEC? and a resident of the school district in New Brunswick for at least six months before election day; and a resident of the relevant school district and subdistrict or zone when nominated. People Who Cannot Be Candidates: A judge, a full-time or permanent part-time employee of the Department of Education and Early Childhood Development or of any school or school district, an election officer, or a person who has been disqualified from holding an elected office under federal, provincial, or municipal election laws, may not be a candidate for any District Education Council election. People Who May Not Be Able To Be Candidates: Some public sector employees are restricted from engaging in political activity, even at a local level, or may need prior approval from their employer before filing nomination papers. If you work in the federal or provincial public service, check with your employer before filing nomination papers. It is the responsibility of a candidate to obtain any approval required by his or her employer; the Municipal Returning Officer will not require or confirm such approval in processing nomination papers. How can I get involved in my District’s DEC? In every school across New Brunswick, the future – our future – is taking shape through our children. District Education Council (DEC) members are on the front lines and are the first point of contact in our publicly funded education system. They bring local knowledge of the education issues in their communities and the interests of their constituents into broader education system discussions. Public education is successful when schools, parents, and the community all work together. Serving as a DEC member is one of the most important responsibilities a citizen can undertake. If elected to serve, you and your fellow DEC members will establish educational goals that will help shape the future of your community and the province. Being a DEC member is a complex and varied job, sometimes frustrating but also very rewarding. Your work will help students achieve, succeed and lead happy, productive lives as a result of your input into the environment and culture of learning. DEC elections are held every four years in conjunction with the municipal elections. In addition to the elected representatives, the Minister will appoint First Nations representatives. Each Council also has a student representative appointed by the Minister. For more information about election dates and the nomination process, contact the Office of the Chief Electoral Officer by calling 1-800-308-2922 or visit their website at www.electionsnb.ca. Which district and sub-district do I live in? Elections NB has created a search feature which will allow you to enter the name of the street where you live and it will provide information on your district and sub-district. 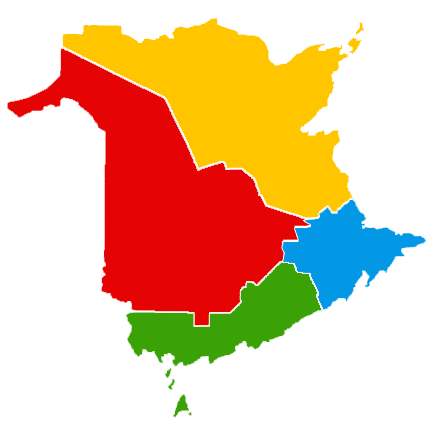 These are the districts and subdistricts as of July 1, 2016. Use the map to find your current district.